In 1992, James Thomas concluded his introduction to the anthology Flash Fiction by wondering “whether ‘flash fiction’ will be an avid endeavor of the present literary generation.” Twenty-three years later, evidenced by the recently published Flash Fiction International edited by Thomas, Robert Shapard and Christopher Merrill, the answer would seem to be a resounding yes, yes indeed. 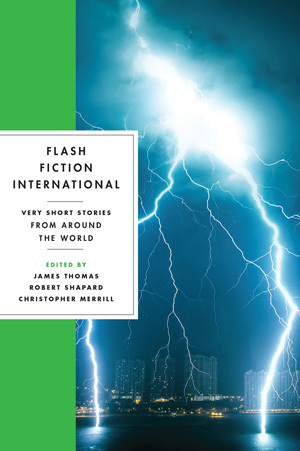 Representing six continents and roughly four dozen countries, the eighty-six stories collected in this anthology suggest that flash is not only alive but thriving. Though the book’s title announces the anthology as “flash fiction,” the introduction often refers to the form simply as “flash”—not merely, I suspect, in the interest of brevity. Rather, by opting not to corral these works into the small pen of a specific genre, the suggestion is that flash transcends genre, that the best works are hybrids combining craft aspects of both prose and poetry. Indeed, what’s collected in this volume include not only fiction, but prose poems and brief nonfictions as well. So whether a story is fact or fiction seems of less interest to the anthology’s editors than the question “is this flash?” That ongoing conversation comprises the section at the end of the anthology, “Flash Theories,” in which practitioners offer up a feast of ideas ranging from the appeal of flash to nuts and bolts advice about craft. Though diverse in form and varying in length, what these eighty-six pieces do share is an allegiance to the classic mode of storytelling in which conflict is introduced immediately—what Janet Burroway refers to in her book Imaginative Writing: The Element of Craft as “a state of unstable equilibrium.” Take “Lost,” by Chilean writer Alberto Fuguet, which opens, “In a country filled with missing people, disappearing is easy” (85). Or “The Snake” by Kenyan writer Eric Rugara with the ominous introductory sentence “The kid saw it first” (73). Or Cate McGowan’s “Arm, Clean Off,” which wastes no time getting down to the title’s nitty-gritty: “The irrigation machine took it, slashed his arm off, a thick gash and a click of bones as it sliced right through” (158). Read that sentence out loud and listen to how the assonant rhyme of the last three syllables demands that we slow down, linger on the horror of the opening image. It’s prose, but it’s poetry, too. When a story is compressed so much, the matter of it tends to require more size: that is, in order to make it work in so small a space its true subject must be proportionately larger (233). Ultimately, these are stories that linger and haunt, that go on after the last sentence has ended. I think of “That Color” by British writer Jon McGregor, a deceptively simple story of an extended moment at home between a long-married couple, an unnamed, archetypal “he” and “she.” Told from the vantage point of the husband, the story accrues its quiet power in alternating narrative and dialogue that slowly pulls the curtain away to suggest the wife’s plight. The story ends as quietly as it begins, with two concluding sentences that land like punches: “I felt for her hand and held it. I said, But tell me again” (147). Such is the power of story, of these stories: To tell us, again and again. Sarah Freligh is the author of A Brief Natural History of an American Girl, winner of the Editor’s Choice award from Accents Publishing, and Sort of Gone, a book of poems that follows the rise and fall of a fictional pitcher named Al Stepansky. Sad Math, the winner of the Moon City Poetry Award, is forthcoming in November 2015. Recent work has been featured on Verse Daily, in The Sun Magazine, Brevity, Rattle, Barn Owl Review, and in the 2011 anthology Good Poems: American Places. Among her awards are a 2009 poetry fellowship from the National Endowment for the Arts and a grant from the Constance Saltonstall Foundation in 2006. Thanks for the review, Sarah. I will have to check it out. Enjoy, Cassandra! A wonderful array of styles and modes of storytelling.